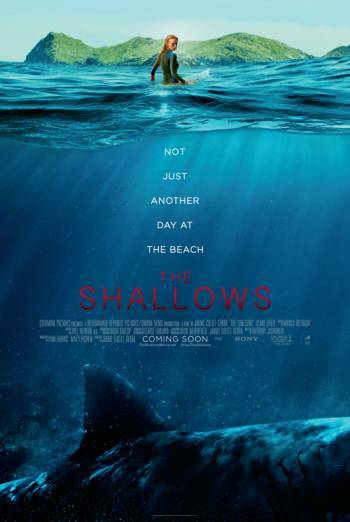 Summary THE SHALLOWS is a US horror thriller in which a young surfer becomes trapped off shore when a great white shark strays into the waters. THE SHALLOWS is a US horror thriller in which a young surfer becomes trapped off shore when a great white shark strays into the waters. There is a sustained sense of threat throughout much of the film, as characters are attacked by a shark, stranded at sea and left exposed to the elements. Occasional scenes of strong injury detail, including focus on a large bloody wound in a woman's leg following a shark attack.